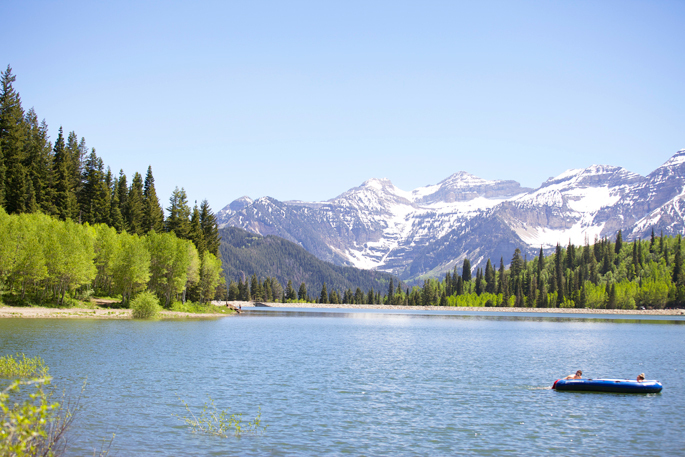 Our home is minutes from the mouth of the canyon and we’ve always loved going up there during the summers to play in the beautiful mountains we have here in Utah. When Dash was a puppy we would take him on walks around the trails and let him chase the ducks in the water and now it’s his favorite place to go! There’s a certain spot on the drive up where Dash figures out where we’re going, from that moment on he can hardly contain his excitement. It’s so peaceful up there and the best part is there’s no service anywhere so it’s become the perfect escape for Drew and I to take our little family to unplug and spend time with each other. 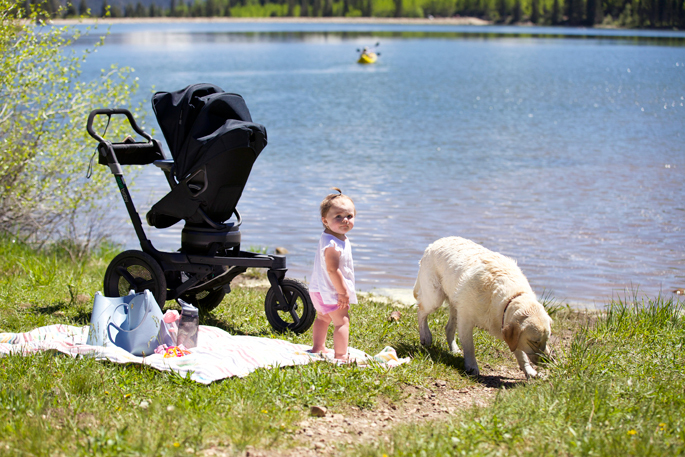 On Saturday we made PB&J’s, and loaded up Isla and Dasher boy to spend a sunny afternoon in the fresh mountain air. Since I’m pregnant my daily exercise consists of walking (not very exciting, I know). We walked on the trail for about a mile before I got too tired and had to sit down. After our little ‘workout’ we sat by the lake and watched Dash chase his tennis balls into the water. Since becoming a mom, trying to find time to go to the gym is almost impossible now so the only workout I get these days are when it involves Isla and Dash. I’m grateful for days like last Saturday that I could get out of the house and get some walking in. 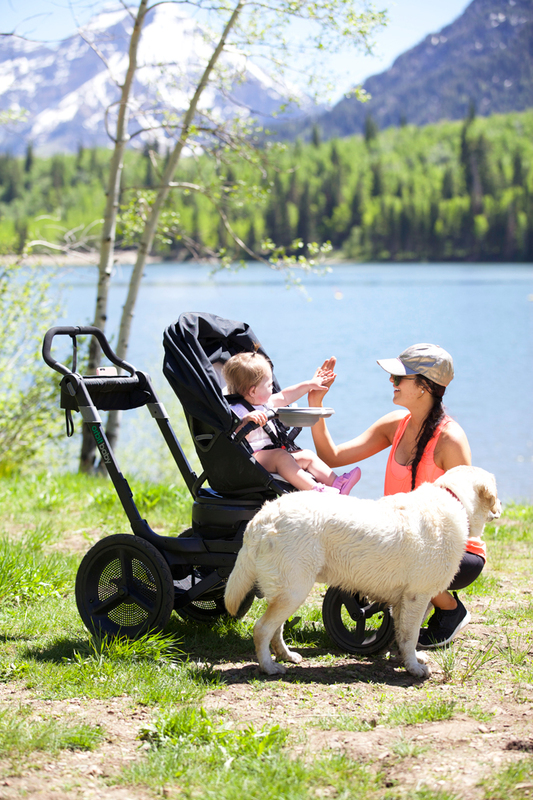 I take my O2 jogging stroller, when we go on walks/jogs up the canyon and Drew uses it almost every day after work. He’s actually been training for a half marathon that’s this Saturday! A few times a week after work he takes Isla in the O2 jogging stroller and Dash runs along side. Every single time Drew gets back from his run, Isla is sound asleep! It’s his favorite way to put her down for a nap these days and it totally works! One thing I wanted to point out about the stroller that makes it my favorite is that the seat can either face towards you or away from you. Sometimes Isla wants to be able to see me or Drew and she’ll cry until we flip it around so she can see us. It makes it fun that we can talk to her while we’re on our walks without having to walk around to the front or get her out. 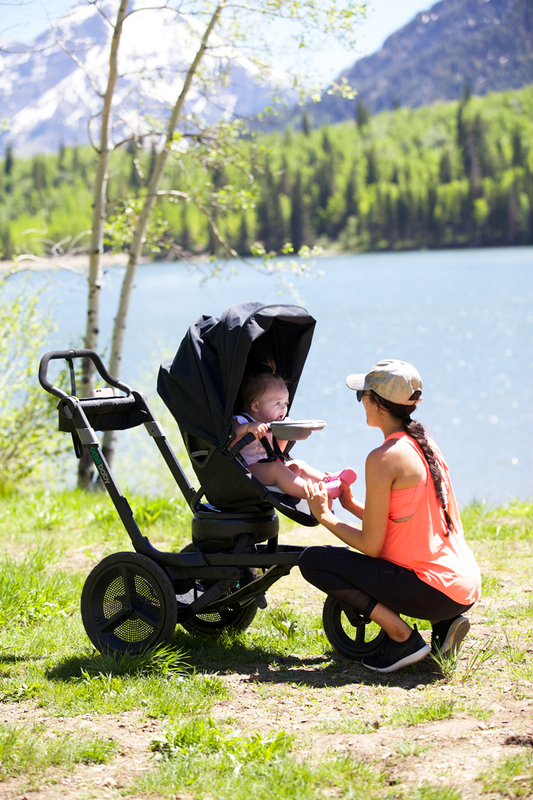 You can see my last post/review on the everyday Orbit stroller here! what a cute and sporty look! Beautiful images…..I have to say as a Brit, we really don’t get the American love for peanut butter and jelly (jam we we say over here!) together at all! Jessica, I get you completely. I’ve been in the U.S. for 11 years now and that the beginning the idea of PB&J was just too odd but I’ve caved in and do enjoy them every now and then. It’s an acquired taste I would say. I’m from Ecuador and we call it jam too (mermelada in Spanish). Such a beautiful little family <3 love your workout top! Going out onto the fresh air must be really nice! You guys are lucky that the mountains are so close to home. It sounds like it was a lovely & successful Saturday. What a beautiful place for photos! Love your workout look. Super cute and great jogger. I have always wondered about your fitness routine. I am NOT bless with good genes and you and your sisters all have great slim figures. So, what is your family secret or is it great genes? Hi Vici!! Honestly working out is big part of it for my sisters and I! Eating healthy and attending the gym regularly (when not pregnant) or doing like active things is something thats really important to me! Oh Brooke I seriously love these and they are so comfortable!! Those views are breathtakingly beautiful! Such a gorgeous place to live! These views are breathtaking, so cool you get to call them your backyard. I’m sure Isla and Dasher love it there. Have a wonderful weekend. Wow Utah is so beautiful! Love your workout look. Love that workout tank! I’ve been looking for one like that. Utah is seriously so beautiful!! How awesome that you live minutes away from this place! I would be there all the time!! Such beautiful scenery <3 Any walk would be exciting in such a scenic area!! Love your athletic wear! Hi Lauren!! It really is so pretty here during the summer!! It’s my favorite! That’s so cute how Dash figures it out! Our chocolate lab did the same thing when she realized we were going to doggy daycare where she got to play with other dogs all day. Looks like a gorgeous place to unwind! Where is this place exactly? Please share! And which canyon? American Fork canyon?? But really, it’s a must see the next time I’m in Utah county! Hi Kari!! YES! It was part way up American Fork Canyon!! What are you using to tie little Isla’s hair up in a pony? On the lookout for something to put up my LO’s hair but am scared to use those little rubber elastics! Hi Ashley!! I use the little elastics but they are for babies and not like adult ones. They are great!! You look so adorable!! Love that you have this little getaway so close to your house for time with your sweet family! Rachel I am wondering what lake this is in American Fork canyon. I don’t recognize its it and go up there often. I keep thinking silver lake but I don’t remember grassy areas. Love this!! I can practically smell that mountain air! And the glittering water is so breathtaking. My husband and I went on a camping trip for Memorial day weekend and I felt similarly about being in nature and out of cell phone service– so rejuvenating!! This is so pretty!!! We just moved to Utah and have been dying to take our two pups to a lake so they can swim and play. Would you mind sharing where this is??? This is just up American Fork Canyon Paige!! It’s so beautiful up there!! Those views are to die for!!! Have you always had the jogger style or do you also have the normal base? I was looking at this because we have the G2 (at least thats what i think it is. We have had ours for 4 years so its a older version.) 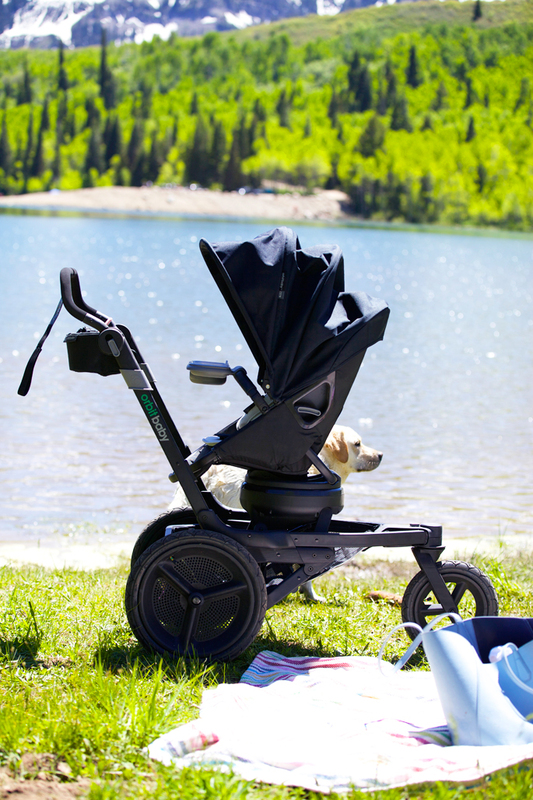 Can it become a double stroller? We now have a second baby also and I need to be able to fit both of them in the jogger for runs. I was not sure if the jogger could be turned into a double with the Helix attachment. Thanks for sharing! Love those smiles. How precious and what a cute pup! You should write a post about blogging tips! I love your blog and your new clothing line is beautiful. I would love to read some of your tips you have learned since you started blogging. Wow you live in a gorgeous place! !